Designed with photographers, videographers, and creative professionals in mind, the SanDisk Extreme 510 Portable SSD combines the performance of a portable SSD with all-terrain durability and water resistance(3). Perfect for your next trek, outdoor adventure or on-location shoot, this truly portable SSD clips securely to your bag or is small enough to conveniently fit in your pocket. With capacity of up to 480GB(*) and read speeds of up to 430MB/s(6), your transfer times are dramatically reduced compared to those of typical hard disk drives, even when moving high-res files(1). 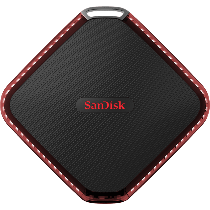 The tough, water-resistant SanDisk Extreme 510 Portable SSD includes 128-bit encryption for password-protection(2), making it a must-have for your most important files. With a rugged, rubber bumper and IP55 protection for water and dust resistance(3), the SanDisk Extreme 510 Portable SSD stands up to typical trek hazards such as rain, splashes, spills, and dusty trails(3) while also cushioning against falls of up to 5.9 feet (1.8 meters)(1). With read speeds of up to 430MB/s6and write speeds of up to 400MB/s(6), copy, backup and transfer times are greatly reduced compared to those of typical hard disk drives, even when moving your highest-res files. This portable SSD features a convenient metal clip that lets you fasten it to your bag and a rugged design that makes it trail-ready. With capacity of up to 480G(5), you’ll be prepared to carry your highest quality content from multiple shoots, whether in the studio or in the field. SanDisk SecureAccess software uses 128-bit AES encryption(2) to keep your private files private. The SanDisk Extreme 510 Portable SSD requires only a small amount of power through the USB 3.0 port—no need to carry additional power cords. (1) As compared to 500GB portable hard drive based on internal speed performance tests. (2) Password protection uses 128-bit AES encryption and is supported by Mac OS X v10.6+, Windows 10, Windows 8, Windows® 7, Windows Vista and Mac OS 10.4+. FOR CHINA: 2 Password protection is supported by, Mac OS X v10.6+, Windows 10, Windows 8, Windows® 7, Windows Vista and Mac OS 10.4+. (3) Water resistant IP55; product must be clean and dry before use. Shock-resistant (up to 800G) and vibration-resistant (5.35gRMS, 50-2000 HZ), Temperature (from -20ºC to 70ºC) (4) see www.sandisk.com/wug (5) 1GB = 1,000,000,000 bytes. Actual user storage less. (6) Based on internal testing; performance may be lower depending on drive capacity, host device, OS and application. 1MB=1,000,000 bytes. This product is backed by a two-year limited warranty. For more information, see the Warranty and User Guide page.